The freedom to connect – the idea that governments should not prevent people from connecting to the internet, to websites, or to each other. The freedom to connect is like the freedom of assembly in cyber space. I hope that refusal to support politically-motivated censorship will become a trademark characteristic of American technology companies. It should be part of our national brand. I’m confident that consumers worldwide will reward firms that respect these principles. Blogs, email, social networks, and text messages have opened up new forums for exchanging ideas – and created new targets for censorship.
. . . Some countries have erected electronic barriers that prevent their people from accessing portions of the world’s networks. They have expunged words, names and phrases from search engine results. They have violated the privacy of citizens who engage in non-violent political speech. . . . With the spread of these restrictive practices, a new information curtain is descending across much of the world. Beyond this partition, viral videos and blog posts are becoming the samizdat of our day. Just as these technologies must not be used to punish peaceful political speech, they must not be used to persecute or silence religious minorities.
. . . the internet can serve as a great equalizer. By providing people with access to knowledge and potential markets, networks can create opportunity where none exists. . . . A connection to global information networks is like an on ramp to modernity. . . . Information networks have become a great leveler, and we should use them to help lift people out of poverty. As we work to advance these freedoms, we must also work against those who use communication networks as tools of disruption and fear. . . . Governments and citizens must have confidence that the networks at the core of their national security and economic prosperity are safe and resilient. This is about more than petty hackers who deface websites. We’ll be asking Americans to send us their best ideas for applications and technologies that help to break down language barriers, overcome illiteracy, and connect people to the services and information they need. Microsoft, for example, has already developed a prototype for a digital doctor that could help provide medical care in isolated rural communities. We want to see more ideas like that. And we’ll work with the winners of the competition and provide grants to help build their ideas to scale. 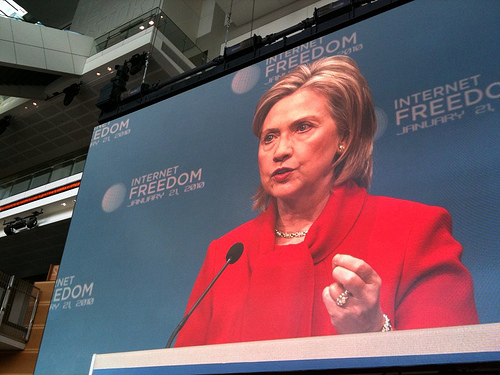 Sounds like the State Department is going to start an Internet Freedom fund. Photo Credit: Flickr/ U.S. State Dept.